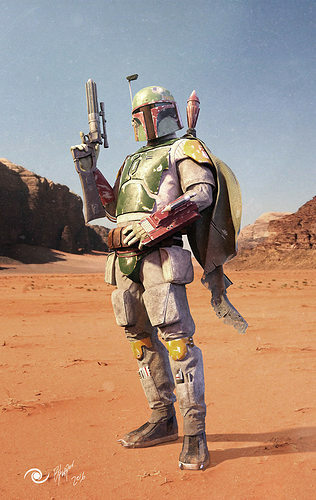 The most notorious bounty hunter in the galaxy, Boba Fett. Created using ZBrush, 3ds Max, Photoshop and Substance Painter. About 40,000 polys, this character is intended for high end games. But he also looks great when rendering in Vray. He is 100% UVW mapped and includes textures for various shader configurations for whatever you might be rendering in such as Vray, Mental Ray, Unity 4, Unity 5, Unreal 4, and CryEngine 3. Includes normal maps for DirectX and openGL. Texture maps are available in TGA, PNG, and EXR formats. So real, if you were Han Solo, you'd be looking over your shoulder. CONSTANTLY.